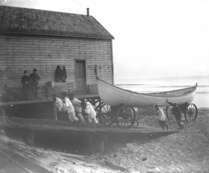 1890s: Men of the Spring Lake Lifesaving Station hauling the boat into the shed. When horses were not available, the lifesavers were harnessed to the skiff to pull it to the scene of a wreck, not an easy task during a blizzard. 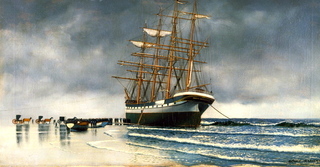 John D. Rockefeller's square-rigged ship "Sindia," ran up on the Ocean City beach in December, 1901. Here it is abandoned to the destruction of the pounding surf. By 1940, only a single mast marked the "Sindia's" burial spot. 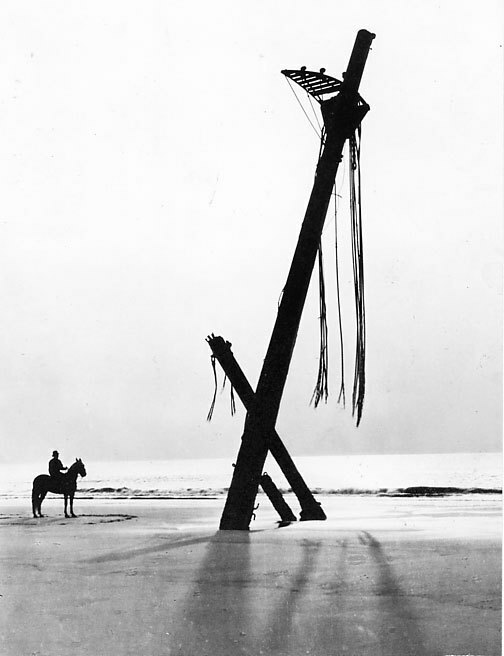 1916: It took tugboats ten days to pull the "Artensis" off the beach at Seaside Park . In 1983, the scallop boat "Liberty" capsized in Manasquan Inlet. Two Coast Guard boats and one helicopter were on the scene and they pulled six crewman from the water, but four men died. 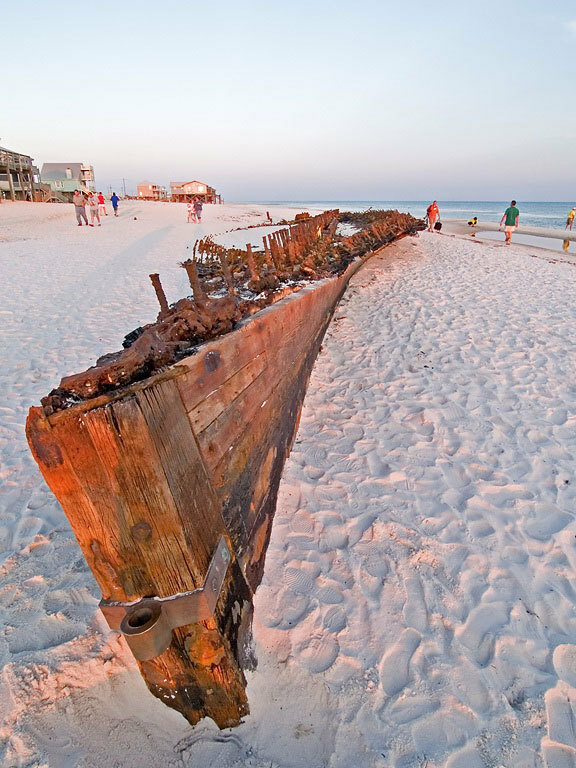 Keels of 19th century sailing ships emerge from the sand after northeast winds erode the beach. The beam from Barnegat Lighthouse parted the ocean's still surface 6 miles offshore. The late October night was clear, yet dark; the moon would rise shortly. Cuban passengers in the iron-hulled, coal-fired liner Vizcaya were lingering in the saloon after their first dinner at sea. Some of the men lounged in the smoking room. José Casarego had gone to bed, tired after the New York boarding, but happy to be on the way to Havana. Chief Officer Felipo Hazas, tall, slight, and elegant looking, was talking to the second officer in his room. The 287-foot Vizcaya was heading due south at 11 knots when the officers heard the engine room bell ring full astern. They ran on deck to see what happened. 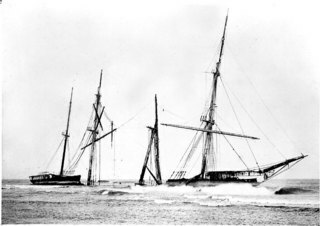 The 225-foot, four-masted schooner Cornelius Hargraves was fairly new; she had been launched in Camden, Maine, in September 1889. 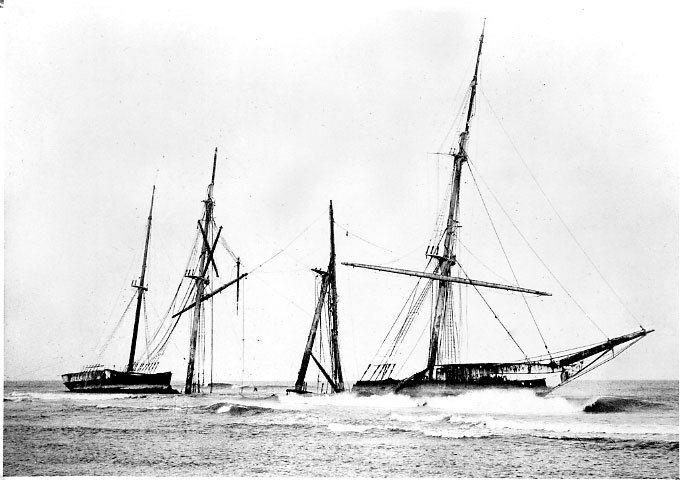 On October 31, 1890 she was off Barnegat under full sail on a port tack, steering northeast at about 8 knots. The ship had had a good run from Philadelphia, where it had taken on a full load of coal. First Mate Henry Perring, who before the sail had enjoyed a visit to his hometown of Fall River, Massachusetts, was on deck with Second Mate Angus Walker. At about 8:30 pm, the lookout spotted the lights of a steamer about 5 miles ahead. Perring had the right of way and held his course. Walker burned a warning torch and called Captain John Allen to come up on deck. He checked his course, eyed the steamer, and said, "I guess we can clear them." The liner didn't alter its course, and Perring testified at the hearing following the collision, "It seemed as if people on the steamer were all either drunk or asleep. They did not swerve a hair's breadth from their course, but simply rushed down upon us." Moments after Allen made the decision to hold his course, Walker said, "We'll strike them, Captain!" Captain Allen swore, then shouted at the top of his voice, "Hard a'starboard! Put your helm hard a'starboard!" At that moment, the Vizcaya crossed right across their bow. Chief Officer Hazas reached the open deck of the Vizcaya just as the two vessels collided. He later recounted, "The bow of the schooner struck us just forward of the bridge on the starboard side. The vessel's headway had been stopped. I went to find the captain but he must have been killed on the bridge." He tried to get to the lifeboats, but all four on the side of the collision had been splintered. He ran for the port side and had almost cut one of the boats free when the liner started to sink. "I sprang into the rigging and climbed up as the water rose," he said. Dr. Andres Rico was in the Vizcaya's smoking room enjoying a cigar when the impact threw him out of his chair. He rushed on deck and saw the schooner's 40-foot bowsprit towering above them, ripping away the rigging and deckhouses. At that moment engineer Francisco Serra came up from the engine room and said that the schooner's bow had pierced the hull and the ship was flooding. The vessel began to settle, and a woman came stumbling up to them with her little boy in her arms, screaming, "For God's sake, save my little one!" The engineer moved to take the boy, but, Dr. Rico said, "the final tremble of the steamer came as the engineer tried to get hold of the child–he just had time to catch the fore rigging as she sank. At least twenty-five men got into the rigging, but one by one, they lost their hold." The little boy was lost. Casarego had been thrown out of bed when the vessels collided. He pulled on some clothes and ran on deck. "Here was a pitiful sight," he later said. "Women were kneeling, praying to the Virgin to help them, and men and sailors were running wildly about as though they had lost all presence of mind." The liner was sinking fast, and Casarego jumped into the frigid water and climbed onto some floating spars. 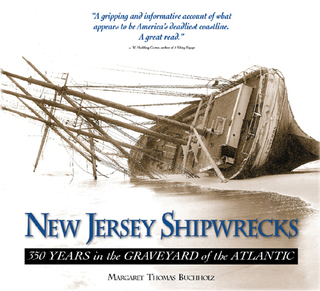 The staggering number of reported shipwrecks over the centuries–about 5000 including both documented and undocumented–has earned New Jersey waters the sorrowful epithet, "Graveyard of the Atlantic." The configuration of the land contributed to the many wrecks that led to building the first lifesaving stations here. Imagine a cone with New York City its apex, Long Island on one side, and New Jersey on the other. Only 6 miles separated Sandy Hook and Coney Island, and before the Swash and Ambrose Channels were dug and maintained, the constantly shifting shoals in the harbor approach made getting in safely a gamble in the best of weather. During a storm, unless a skipper could beat to windward, any northeast gale would blow an inbound sailing vessel onto the lee shore–the Jersey shore. Sandbars parallel the coast from 200 to 400 yards offshore, with depths as little as 3 feet at low tide. The American Coast Pilot in 1800 warned mariners about the shoal at Barnegat Inlet, saying: "It does not extend beyond three miles from the beach and is very steep too. You may turn this shoal in six fathoms of water within pistol shot of the outward breakers." If a ship grounded on any of the offshore shoals and didn't break up, but was blown over it and stranded near enough to shore for the crew to swim in–if the water was warm enough to avoid hypothermia–what awaited the men on the beach? On the barrier islands south of Manasquan Inlet the dunes rose to 20 feet and behind them was a dense growth of bayberry, sumac, cedar, scrub pine, sea oats, and beach plum, with a tidal marsh beyond that. And perhaps an occasional fishing or gunning shack, but no villages. When Newell introduced his lifesaving bill, the Second District coast was almost totally unpopulated; most people farmed inland. Tuckerton was a thriving port at the southern end; Manahawkin, Waretown and Toms River were small villages; Point Pleasant had a few boarding houses and Long Branch had boarding houses and five new hotels. But the roughly 57 miles of shoreline between Long Branch and Little Egg Harbor Inlet had no villages except for Squan. With the exception of a small settlement on Absecon Island–which wouldn't become Atlantic City until 1854– the situation south to Cape May was equally bleak. A stranded mariner could walk for 10 miles in either direction–if he had the strength left–and not find even a fisherman's hut for shelter. Only if the ship could be seen from the mainland might help come. Eight government lifesaving stations were in place by May 21,1849. The 28-by-16 foot, one-room frame huts were built on pilings, designed to be moved to a different location if the encroaching sea altered the shoreline. Captain Ottinger equipped each with a galvanized iron surfboat and a beach cart, although in a letter to Newell he explained that the "most intelligent" surfmen had recommended a lightweight wooden boat. The energetic officer also wrote Newell that he was experimenting with "throwing a line from the shore to a vessel with a rocket." Each station was outfitted with mortar apparatus, lanterns, shovels, stove, and firewood, as well as the new iron lifecar–complete with air chambers and India rubber floats and fenders–built by Toms River boat builder Joseph Francis. Both the new lifecar, as yet untried, and the line shot from a mortar would be instrumental in saving lives in the following decades.